FOLLOWING the deaths of cyclists, Jared Dwyer (36), Richard da Silva (46) and most recently Craig Diedricks (52) who were all killed on the M4 Ruth First Highway, a local cyclist has decided to take a stand. 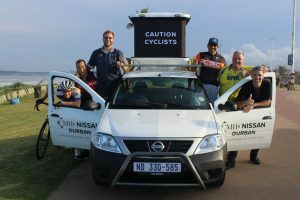 Durban North resident and CMH Nissan Durban dealer principal, Stuart Singleton, has donated a dedicated vehicle to help patrol and support cyclists using the M4 on rides. The MEBU (mobile electronic branding unit) vehicle is fitted with roof sign saying ‘Caution Cyclists’. The vehicle is also kitted with puncture kits, first aid kits and has a dedicated paramedic driving the vehicle up and down the M4. “I’ve been thinking about this ever since Richard and Jared’s passing. As a cyclist myself and being part of Kings Park Cycling I really felt an initiative was needed. The vehicle has a collapsible roof with a sign that is well-lit. I’ve partnered with Life Response Paramedics, so there will always be a paramedic in the vehicle. The vehicle we are using is used by the dealership during the week will now be used over the weekend to provide support to cyclists using the M4. This vehicle is for every cycling club in Durban using the highway. Even if you aren’t from a club, cycling along the M4, the vehicle will be there to help if you get into some sort of trouble on the road. “We’ve also got a dedicated number (083 634 5207) that cyclists can call for assistance. Most of the rides take place early in the morning and this vehicle will be mobile on the M4 between 5am and 11am every Saturday and Sunday going as far as Ballito and back to Durban again,” he said. Singleton said he was considering putting in a second vehicle following a successful launch.